I’ve made the argument time and time again that procurement groups rely too heavily on a rigid standardized and templated strategic sourcing process; and because of it, receive mediocre results and responses from their suppliers. Using software tools to “automate” the process (looking at you Ariba!) often make the problem ten times worse. (To be clear, this isn’t Ariba’s fault, but the users of it and tools like it often do not have proper strategic sourcing processes and training in place). Time and time again we are exposed to poor sourcing practices within companies as consultants looking in; or we ourselves are invited to bid our services utilizing mandated sub-par sourcing practices and tools. Having a rigid, structured RFP process (especially when combined with e-sourcing software) will ultimately cost you more money for the goods or services you are looking to buy. Period. Don’t Let Your Suppliers Write Your RFP! BUT, let’s nitpick the very beginning of the process that MANY of you are guilty of. That is, creating an RFP and then inviting suppliers to respond to it without ever speaking to suppliers. Even worse are those of you that forbid communications from the supplier during the RFP event itself, or cap conversation to basic written questions. They will likely put more detail, thought, and care into their response: answering questions you didn’t even know you had: shortening the scorecarding process. More Suppliers will respond. This is pretty straight forward. If a supplier doesn’t think they can win your business, they may not even try. For those of you thinking “good, if they aren’t looking for our business then they aren’t a good partner” - You’re wrong. Great suppliers, the ones that are extremely busy with work right now, aren’t going to chase business where they think they will have poor relationships. Simply put, many suppliers would rather talk to companies that treat them as partners rather than retail stores. They may provide alternatives that you have not thought about. You likely haven’t sourced this product or service in a while. Even if you had, are you sure you really know every single innovation in that product? Are you sure you are asking for the right thing or cost structure from a services supplier? Let’s look at this example - which I’ve seen twice in the last two weeks - A company is looking for a consulting firm (like Source One) that can help source and benchmark a variety of categories. They write an incredibly robust RFP document that focuses on primarily generic questions (financials, demographics, geography) and doesn’t really ask questions that would help qualify the quality of the consulting services. They then ask for the providers to bid a daily rate pricing for consultants and attach resumes of each consultant. In one of these RFPs, they limited questions to a simple open-forum Q&A, in the other they restricted all communications from the stakeholders and purchasing groups. What’s the problem? A rate card consultant on a daily plan is probably the most expensive way you could handle this engagement; you are restricted to their time, their individual experience, and you will be paying for them even during the down-time portions of your project lifecycle. There are plenty of better, ways to provide consulting support and resource that would not only be more cost effective, but would provide a better experience with stakeholders (like a managed services provider model). So, we have a solution for you, that is better than what you were looking for, and it costs less; but I don’t have a way of communicating it to you and your template is too rigid to allow deviation. Worse for you, since we don’t feel that this is a real opportunity, and we haven’t been allowed to ask questions and explore your team’s thinking; we think you are simply looking for pricing to leverage your incumbent. That means we aren’t going to even respond to your RFP. I can’t think of any categories of situations that the sourcing process should exclude conversations with potential suppliers. If you can think of one, please post it in the comments. 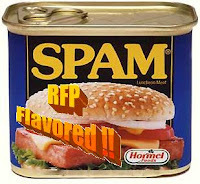 Please help, only you can prevent RFP Spam!